The different actors in a blockchain network include peers, orderers, client applications, administrators and more. Each of these actors — active elements inside or outside a network able to consume services — has a digitial identity encapsulated in an X.509 digital certificate. These identities really matter because they determine the exact permissions over resources and access to information that actors have in a blockchain network. A digital identity furthermore has some additional attributes that Fabric uses to determine permissions, and it gives the union of an identity and the associated attributes a special name — principal. Principals are just like userIDs or groupIDs, but a little more flexible because they can include a wide range of properties of an actor’s identity, such as the actor’s organization, organizational unit, role or even the actor’s specific identity. When we talk about principals, they are the properties which determine their permissions. For an identity to be verifiable, it must come from a trusted authority. A membership service provider (MSP) is how this is achieved in Fabric. More specifically, an MSP is a component that defines the rules that govern the valid identities for this organization. The default MSP implementation in Fabric uses X.509 certificates as identities, adopting a traditional Public Key Infrastructure (PKI) hierarchical model (more on PKI later). Imagine that you visit a supermarket to buy some groceries. At the checkout you see a sign that says that only Visa, Mastercard and AMEX cards are accepted. If you try to pay with a different card — let’s call it an “ImagineCard” — it doesn’t matter whether the card is authentic and you have sufficient funds in your account. It will be not be accepted. Having a valid credit card is not enough — it must also be accepted by the store! PKIs and MSPs work together in the same way — a PKI provides a list of identities, and an MSP says which of these are members of a given organization that participates in the network. PKI certificate authorities and MSPs provide a similar combination of functionalities. A PKI is like a card provider — it dispenses many different types of verifiable identities. An MSP, on the other hand, is like the list of card providers accepted by the store, determining which identities are the trusted members (actors) of the store payment network. MSPs turn verifiable identities into the members of a blockchain network. Let’s drill into these concepts in a little more detail. A public key infrastructure (PKI) is a collection of internet technologies that provides secure communications in a network. It’s PKI that puts the S in HTTPS — and if you’re reading this documentation on a web browser, you’re probably using a PKI to make sure it comes from a verified source. The elements of Public Key Infrastructure (PKI). A PKI is comprised of Certificate Authorities who issue digital certificates to parties (e.g., users of a service, service provider), who then use them to authenticate themselves in the messages they exchange with their environment. A CA’s Certificate Revocation List (CRL) constitutes a reference for the certificates that are no longer valid. Revocation of a certificate can happen for a number of reasons. For example, a certificate may be revoked because the cryptographic private material associated to the certificate has been exposed. Although a blockchain network is more than a communications network, it relies on the PKI standard to ensure secure communication between various network participants, and to ensure that messages posted on the blockchain are properly authenticated. It’s therefore important to understand the basics of PKI and then why MSPs are so important. Let’s quickly describe these PKI basics, and if you want to know more details, Wikipedia is a good place to start. A digital certificate is a document which holds a set of attributes relating to the holder of the certificate. The most common type of certificate is the one compliant with the X.509 standard, which allows the encoding of a party’s identifying details in its structure. For example, Mary Morris in the Manufacturing Division of Mitchell Cars in Detroit, Michigan might have a digital certificate with a SUBJECT attribute of C=US, ST=Michigan, L=Detroit, O=Mitchell Cars, OU=Manufacturing, CN=Mary Morris /UID=123456. Mary’s certificate is similar to her government identity card — it provides information about Mary which she can use to prove key facts about her. There are many other attributes in an X.509 certificate, but let’s concentrate on just these for now. A digital certificate describing a party called Mary Morris. Mary is the SUBJECT of the certificate, and the highlighted SUBJECT text shows key facts about Mary. The certificate also holds many more pieces of information, as you can see. Most importantly, Mary’s public key is distributed within her certificate, whereas her private signing key is not. This signing key must be kept private. What is important is that all of Mary’s attributes can be recorded using a mathematical technique called cryptography (literally, “secret writing”) so that tampering will invalidate the certificate. Cryptography allows Mary to present her certificate to others to prove her identity so long as the other party trusts the certificate issuer, known as a Certificate Authority (CA). As long as the CA keeps certain cryptographic information securely (meaning, its own private signing key), anyone reading the certificate can be sure that the information about Mary has not been tampered with — it will always have those particular attributes for Mary Morris. Think of Mary’s X.509 certificate as a digital identity card that is impossible to change. Authentication and message integrity are important concepts in secure communications. Authentication requires that parties who exchange messages are assured of the identity that created a specific message. For a message to have “integrity” means that cannot have been modified during its transmission. For example, you might want to be sure you’re communicating with the real Mary Morris rather than an impersonator. Or if Mary has sent you a message, you might want to be sure that it hasn’t been tampered with by anyone else during transmission. Traditional authentication mechanisms rely on digital signatures that, as the name suggests, allow a party to digitally sign its messages. Digital signatures also provide guarantees on the integrity of the signed message. Technically speaking, digital signature mechanisms require each party to hold two cryptographically connected keys: a public key that is made widely available and acts as authentication anchor, and a private key that is used to produce digital signatures on messages. Recipients of digitally signed messages can verify the origin and integrity of a received message by checking that the attached signature is valid under the public key of the expected sender. The unique relationship between a private key and the respective public key is the cryptographic magic that makes secure communications possible. The unique mathematical relationship between the keys is such that the private key can be used to produce a signature on a message that only the corresponding public key can match, and only on the same message. 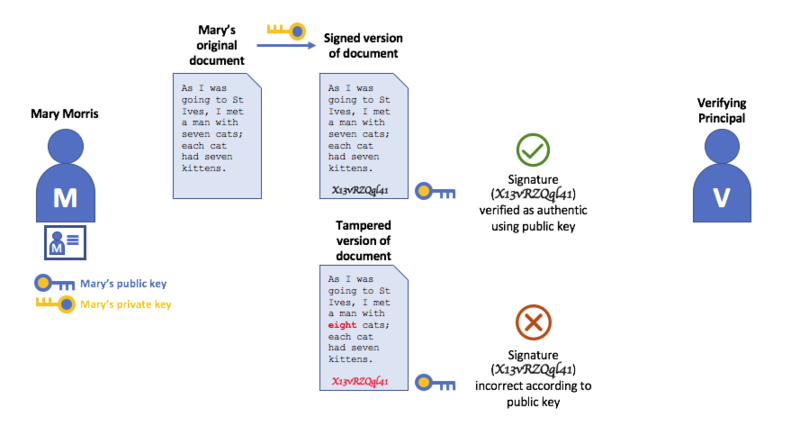 In the example above, Mary uses her private key to sign the message. The signature can be verified by anyone who sees the signed message using her public key. As you’ve seen, an actor or a node is able to participate in the blockchain network, via the means of a digital identity issued for it by an authority trusted by the system. In the most common case, digital identities (or simply identities) have the form of cryptographically validated digital certificates that comply with X.509 standard and are issued by a Certificate Authority (CA). CAs are a common part of internet security protocols, and you’ve probably heard of some of the more popular ones: Symantec (originally Verisign), GeoTrust, DigiCert, GoDaddy, and Comodo, among others. A Certificate Authority dispenses certificates to different actors. These certificates are digitally signed by the CA and bind together the actor with the actor’s public key (and optionally with a comprehensive list of properties). As a result, if one trusts the CA (and knows its public key), it can trust that the specific actor is bound to the public key included in the certificate, and owns the included attributes, by validating the CA’s signature on the actor’s certificate. Certificates can be widely disseminated, as they do not include either the actors’ nor the CA’s private keys. As such they can be used as anchor of trusts for authenticating messages coming from different actors. CAs also have a certificate, which they make widely available. This allows the consumers of identities issued by a given CA to verify them by checking that the certificate could only have been generated by the holder of the corresponding private key (the CA). In a blockchain setting, every actor who wishes to interact with the network needs an identity. In this setting, you might say that one or more CAs can be used to define the members of an organization’s from a digital perspective. It’s the CA that provides the basis for an organization’s actors to have a verifiable digital identity. CAs come in two flavors: Root CAs and Intermediate CAs. Because Root CAs (Symantec, Geotrust, etc) have to securely distribute hundreds of millions of certificates to internet users, it makes sense to spread this process out across what are called Intermediate CAs. 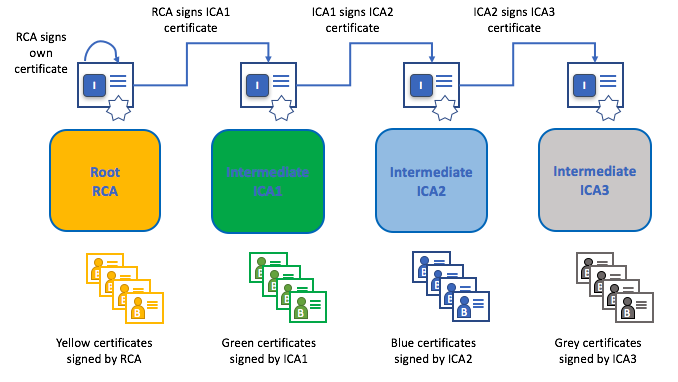 These Intermediate CAs have their certificates issued by the root CA or another intermediate authority, allowing the establishment of a “chain of trust” for any certificate that is issued by any CA in the chain. This ability to track back to the Root CA not only allows the function of CAs to scale while still providing security — allowing organizations that consume certificates to use Intermediate CAs with confidence — it limits the exposure of the Root CA, which, if compromised, would endanger the entire chain of trust. If an Intermediate CA is compromised, on the other hand, there will be a much smaller exposure. A chain of trust is established between a Root CA and a set of Intermediate CAs as long as the issuing CA for the certificate of each of these Intermediate CAs is either the Root CA itself or has a chain of trust to the Root CA. Intermediate CAs provide a huge amount of flexibility when it comes to the issuance of certificates across multiple organizations, and that’s very helpful in a permissioned blockchain system (like Fabric). For example, you’ll see that different organizations may use different Root CAs, or the same Root CA with different Intermediate CAs — it really does depend on the needs of the network. It’s because CAs are so important that Fabric provides a built-in CA component to allow you to create CAs in the blockchain networks you form. This component — known as Fabric CA is a private root CA provider capable of managing digital identities of Fabric participants that have the form of X.509 certificates. Because Fabric CA is a custom CA targeting the Root CA needs of Fabric, it is inherently not capable of providing SSL certificates for general/automatic use in browsers. However, because some CA must be used to manage identity (even in a test environment), Fabric CA can be used to provide and manage certificates. It is also possible — and fully appropriate — to use a public/commerical root or intermediate CA to provide identification. If you’re interested, you can read a lot more about Fabric CA in the CA documentation section. A Certificate Revocation List (CRL) is easy to understand — it’s just a list of references to certificates that a CA knows to be revoked for one reason or another. If you recall the store scenario, a CRL would be like a list of stolen credit cards. When a third party wants to verify another party’s identity, it first checks the issuing CA’s CRL to make sure that the certificate has not been revoked. A verifier doesn’t have to check the CRL, but if they don’t they run the risk of accepting a compromised identity. Using a CRL to check that a certificate is still valid. If an impersonator tries to pass a compromised digital certificate to a validating party, it can be first checked against the issuing CA’s CRL to make sure it’s not listed as no longer valid. Note that a certificate being revoked is very different from a certificate expiring. Revoked certificates have not expired — they are, by every other measure, a fully valid certificate. For more in-depth information about CRLs, click here. Now that you’ve seen how a PKI can provide verifiable identities through a chain of trust, the next step is to see how these identities can be used to represent the trusted members of a blockchain network. That’s where a Membership Service Provider (MSP) comes into play — it identifies the parties who are the members of a given organization in the blockchain network. To learn more about membership, check out the conceptual documentation on MSPs.